Dudes, I adore my two boys but I NEED to rediscover who I am when I’m not Mummy. I need to reform my own identity and I’ve been trying to work out how to do that whilst juggling all the other commitments that make up life – you know; being a mother, wife, employee so I can help pay the bills, and supporting the school and Beavers (the youngest level of Scouting), swimming lessons… The list goes on! I have to admit that SewBusyLizzy has been the voice of reason on a number of occasions and I am so happy that sewing has brought me this friendship! Lizzy is a one woman power house and crams an insane amount into each 24hr period but also manages to (mostly!) find time for herself. So I’m following her advice and carving some time out for me. Some of it involves sewing (hurrah!) & some involves a new gym membership (also hurrah for me, but boring for you guys!). Sewing is my happy place, its something that easily gets me into a state of flow where everything else just melts away. However, Husband is currently wandering around with a tape measure and is preparing to deploy the sledge hammer… This means that I am going to have to clear everything out of the office so that it can be partitioned to create a utility room that will be accessed from our kitchen. Holes will be knocked in walls. I really want, in fact NEED, to do some sewing that isn’t repairing holes in A’s trousers. So I’m planning to put together three or four ‘kits’ so that I can keep some projects accessible along with my machines on the dining table. I want to be as sure as I can that these projects will be successful and really help kickstart my sewing again. So I’ve been having a real think about what it is I want to sew and what it is I need to sew. I’ve been reading into-mind a lot recently. It’s a site that Sarai referenced as part of the Colette Wardrobe Architect series a few years ago. I have always meant to work through that series properly but never really got round to it. The guidelines and articles on into-mind have resonated more with me and I have actually been doing some of the exercises suggested. This has really helped me define what it is I want to wear and also enabled me to put together a colour palette. I find this really exciting as until now I have always been very whimsical with my sewing and simply made whatever I wanted with no real plan in place. I have sewn for events where a little more planning has been involved but thats been the limit of my considered, thought out sewing. I’ve created a whole Pinterest board with images of outfits and colours that make me happy and that I aspire to. It’s all very predictable in a lot of ways – fit and flare silhouettes, shirt dresses, pencil skirts, flared skirts, jeans. I aspire to be far more ‘put together’ than I actually am. Two things that it has really opened my eyes to though are the proportions I like and also the colours! In terms of form, I like a fitted top with a more voluminous bottom, and vice versa but the waist is always defined. 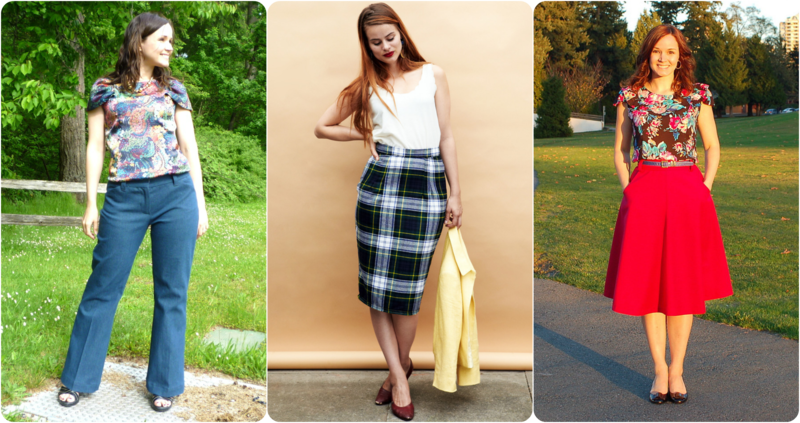 So pencil skirts with draped blouses or a flowing maxi or a circle skirt with a fitted tank or t-shirt. Colour wise, I used my board to create a colour palette using Gillian’s tutorial on Crafting a Rainbow. Those that know me will not be surprised that navy and purple dominate with other cool tones and the odd pop of red, gold, turquoise and cobalt. I’m also drawn to tropical prints and large scale florals too. As a result I’m re-evaluating the fabrics in my collection and re-homing those that don’t suit the wardrobe I now want to sew. There will still be some crazy or whimsical prints in there though because I’m too weak to resist and every wardrobe needs a wild card or two! I’ll pull together my final kits over the weekend (as well as a few Anderson blouses that need finishing and a pencil skirt that has been waiting for a hem since January…) and share them next week. I haven’t been this motivated to find the time to sew for far too long! I’ve missed connecting with you all, so I’m gonna try and visit this space a little more often. I can’t guarantee sewing in every post – sometimes it’ll just be ‘what I would sew if I didn’t need to sleep!’. Anyway, I just wanted to let you know about the writeon campaign. It’s a way to communicate and connect using the written word instead of email, text, twitter or other instant electronic forms! Basically to “promote joy, creativity, expression and connection through hand-written correspondence”. I love receiving letters through the post that isn’t official but necessary stuff like mortgage statements, utility bills, bank statements. Something unique, personal and a bit different from the ordinary always makes me smile! So, I want to join in on the challenge and write 30 letters over the 30 days of April. I have some recipients in mind already, but if you would love to receive a little missive at some point next month, email me your address and I’ll try to write to you! I swear time is definitely more wobbly-wobbly-timey-wimey than any sort of constant. The last six or seven weeks have just disappeared; it’s been a roller coaster, that’s for sure but I think we’re starting to find some sort of new normality. I’d like to introduce Boy J, baby brother to Boy (now known as Boy A)! These photos have all been robbed from Husband’s i-Phone as I didn’t take any in the first few days. I had gestational diabetes whilst pregnant which meant my labour was induced at 38 weeks. 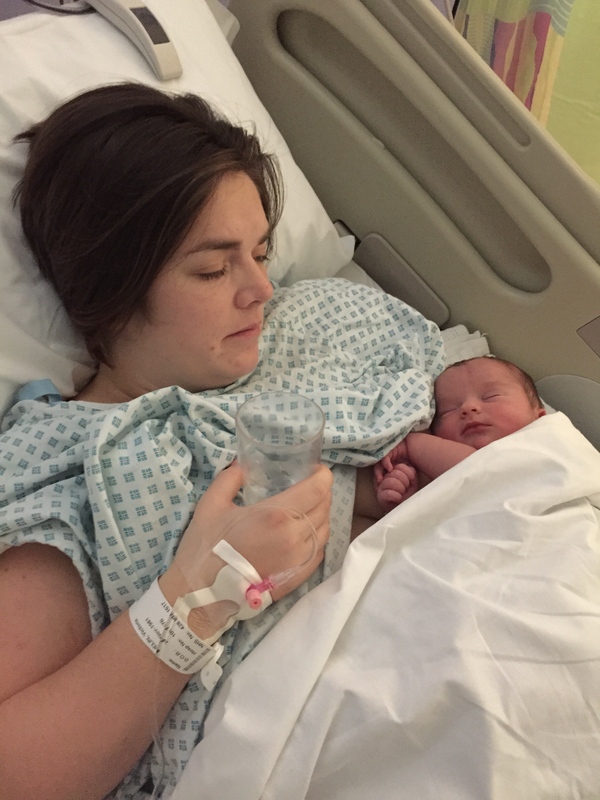 This went well and I’d got to 3cm in 24hrs so it was decided that they would artificially break my waters on the delivery suite to continue the momentum – this is all normal by the way for an induced labour. This is also where we deviated from the text book. During my pregnancy the scans had shown a lot of amniotic fluid, but the last scan had shown that the levels were normal. When my waters were broken there was a LOT of water and the poor doctor got drenched. Contractions started up beautifully but the baby’s heart rate was dropping by over 50% with each contraction. This was not good. When there’s a lot of water, the baby has more room to move about – think swimming pool versus bath tub. Because there’s more room their head can come out of the pelvis more easily and as a result the umbilical cord can be flushed down into the space their head should be. This is what happened. Once the water had gone, each time I had a contraction Boy J’s head was being forced onto his umbilical cord and cutting off his life support. 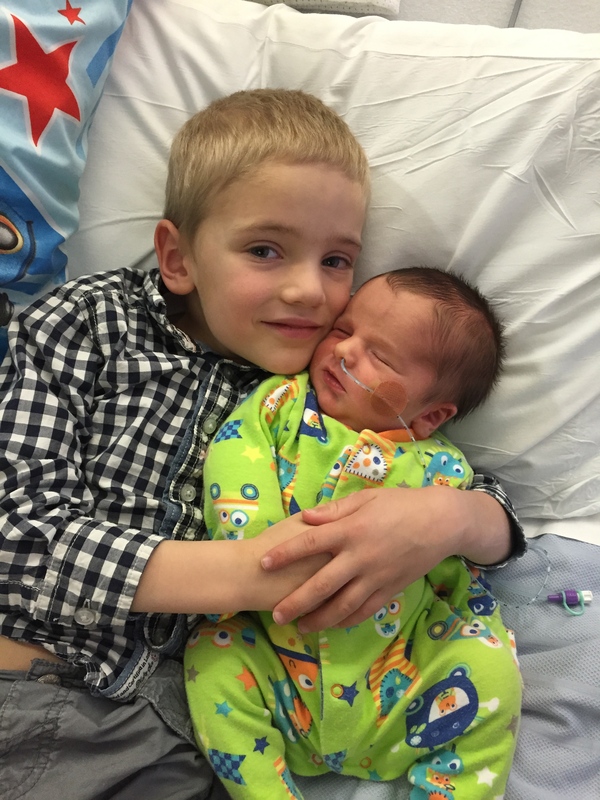 Boy J was delivered by an emergency C-Section in the early hours of that Saturday morning. As soon as I saw the heart rate dropping I knew what was going to happen but I will admit to never being so terrified in my life. Not for myself but for the baby. Husband has said he’s never been so terrified either. We went from us plus a midwife and doctor in the room to more than a dozen, with my clothes being ripped off as I was prepped for surgery as I went down the corridor. I have maybe two or three very vivid memories of those few minutes (all of how amazing the NHS staff were) then nothing until Husband handed me a baby and said it was a boy. That first day doesn’t really exist for me. About three hours old. And seriously spaced out me. 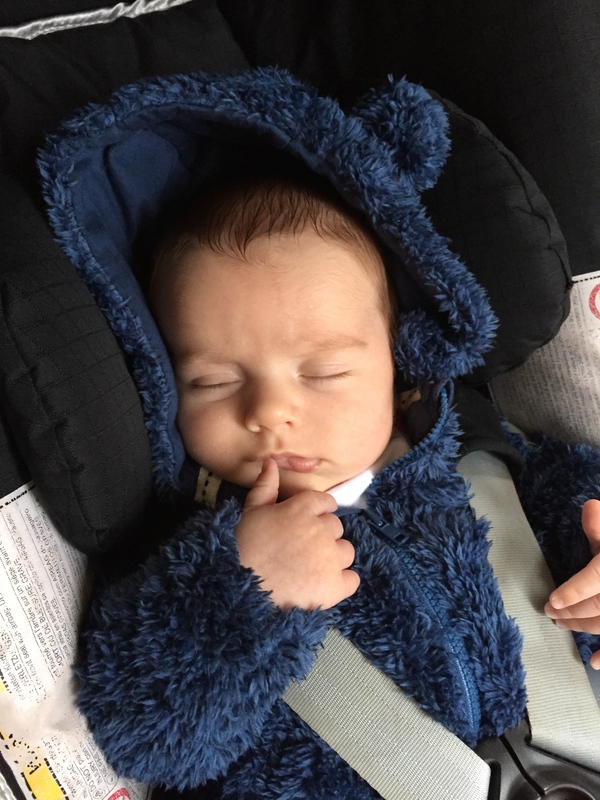 Boy J had to go to NICU (Neonatal Intensive Care Unit) on the Saturday evening so that he could be tube fed so that his blood sugars could be stabilised (the gestational diabetes puts the baby’s levels out of sync for a short period too, so their body has to learn what to do). Again the staff were amazing and in less than 24 hours he was discharged from their care, back to the post natal ward and back to me. I’d been told I could go home on the Sunday too, so late Sunday night the midwives sorted our paperwork out and we came home on the Monday. Unfortunately the pain I was in got worse and worse to the point I could hardly walk. I’d had major abdominal surgery so wasn’t expecting to be doing cartwheels, but I was immobile. I couldn’t even pick Boy J up from his moses basket next to me. I was also running a temperature, going hot and cold and literally counting down the minutes until I could take the next set of pain killers. My wound had got infected and whilst my GP and the doctor I saw at the hospital thought so, a registrar basically said I was making a fuss over nothing, of course it’d hurt and sent me home. That night my scar ruptured and I’ll spare you the details – it was disgusting and made me want to throw up (and I’m pretty bomb-proof). But again, the staff at the hospital were brilliant and spent a considerable amount of time draining it and sorting my after care out. The lead consultant in gynaecology then did several follow up appointments and he discharged me a couple of weeks ago. I’m able to drive again too now which is just amazing. Living in a rural area my car isn’t a luxury – for the last six weeks I couldn’t even get Boy A to school. My parents and siblings bailed me out with out any complaint. In fact my Dad seems to miss doing the school run in the morning?! All in all, a bit of a rough ride but me and Boy J are doing fine. Boy A adores him and we’re finding our feet! I’m incredibly grateful for the amazing things the NHS has done for me and Boy J in the last few months, and for my amazing Husband and family who’ve maintained as much ‘normal’ as possible for Boy A. There’s sweet FA sewing going on but that hasn’t stopped me living vicariously through all your blogs, Instagram posts and tweets! At some point I’ll organise my space in the office, but for now I’m enjoying baby cuddles! Guys, you have no idea what I opened my blog reader to yesterday morning!! It was the best surprise ever and one that seven rather wonderful people had kept quite since September last year! I’m staggered that this has happened, never mind been kept so quiet!! If you haven’t guessed yet, I was thrown a virtual baby shower by my online blogging friends! I can’t begin to express how surprised and touched I am by the time and effort that has gone into the items they have made for our impending small person. I knew the instigator, Anne of Annabelle Bumps, was planning on making something for bump but I had no idea that she’d rope so many others into doing the same thing!! Things like this is one of the reasons I absolutely adore being part of this community; the selfless and generous sprit of so many people who sew and knit seems to know no bounds. Look at what these gorgeous, spirited, generous people have made for bump!! 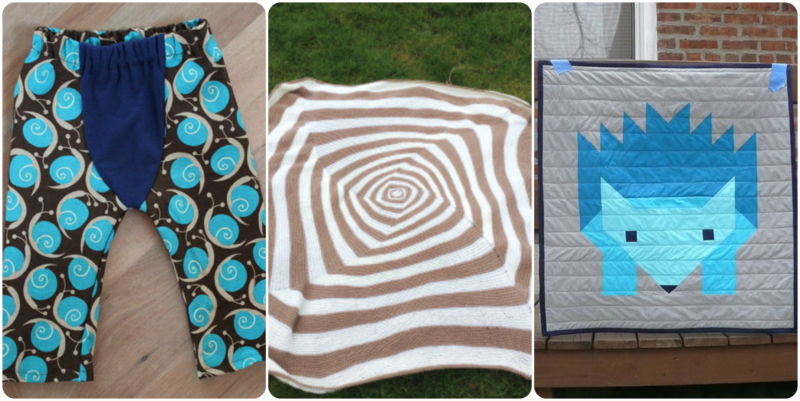 Sonja of Ginger Makes took on quilting and has made the most gorgeous hedgehog quilt, in the most beautiful colours! Kat of Modern Vintage Cupcakes and Muse Patterns, despite having a very active toddler and a young baby herself, and being the brains and beauty behind an indie sewing pattern co, has made two pairs of leggings (one of which has snails!! 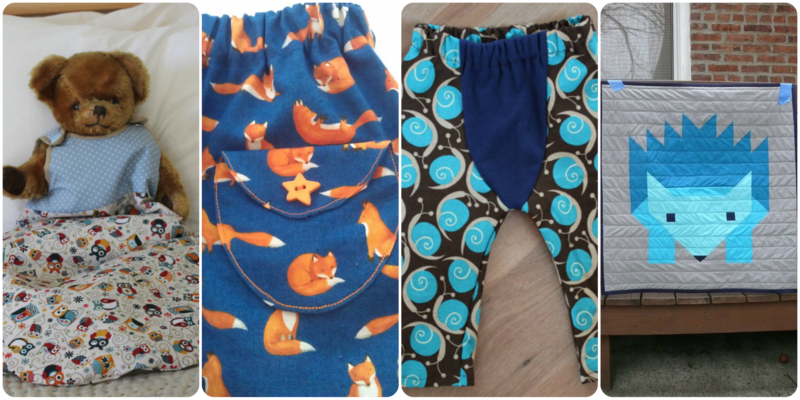 ), Dottie Doodle of Dottie Doodle has made the most gorgeous sleep sack with owls and Tabatha (aka Louise) of Thread Carefully has made the cutest pair of fox print trousers for when bump is slightly older! Bump is going to style Me Made May outta the park!! So much consideration has gone into the construction too, with comfy knit fabrics, snaps and robust seams. As well as some serious seam ripper time by the sounds of it! I absolutely adore the animal theme and colours that have ended up being in bump’s collection too; all creatures we see in our garden or in the fields behind, plus blues and earth tones. Just perfect. 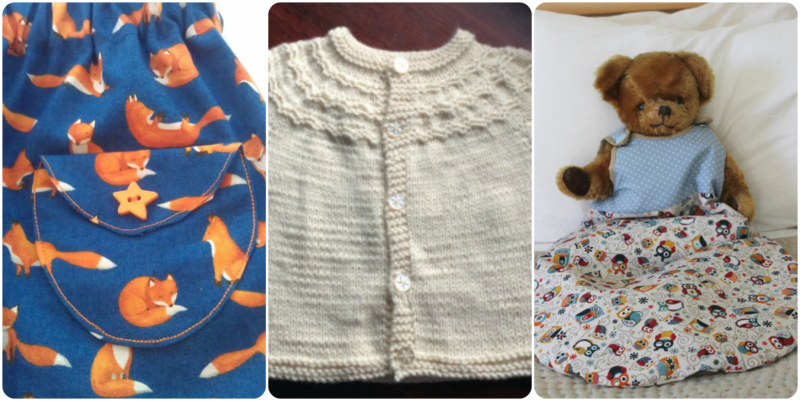 But if I wasn’t spoilt enough, people have been wonderful enough to hand knit gorgeous items as well! I can knit (just) but seriously don’t have the patience for it and these items are just works of art! Anne has made not one but TWO cardigans because we don’t know if bump is a he or a she! 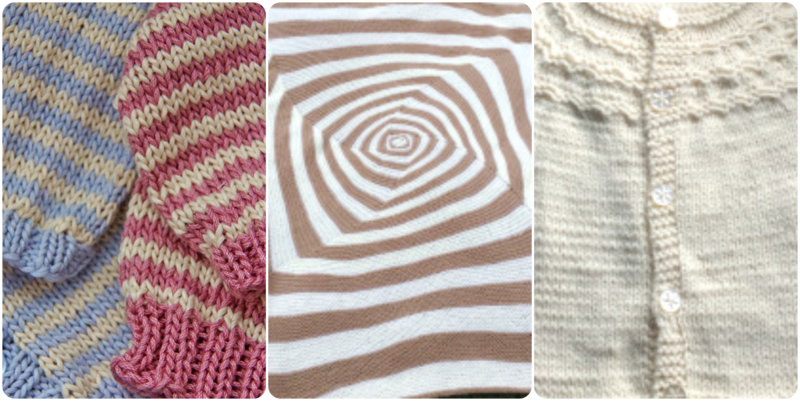 5CurrantBuns who blogs over at Being Frank has made the most amazing spiral blanket in gorgeous, earthy tones and the wonderful Symon Sez has created a beautiful cardigan – look at that detail around the neck and it’s repeated at the cuffs!! Again, so much care has gone into pattern and material selection so that we’re not worried about using or washing these gorgeous items. All these wonderful people are so talented, you should go an have a look at what else they get up to!! I am totally and utterly amazed and grateful for the time and love that has gone into these gifts. I can’t quite believe that this is all for our imminent arrival!! You wonderful, amazing, generous people are far more organised than I am – I’ve only just found the changing mat and have no idea where the covers are at the moment… Who’s going to look after Boy, hospital bags and the car seat are the only things that are properly sorted! I am so pleased that, with everything else that is going on in the world, Boy and (all being well) Bump are growing up in a world where people do still care, do still cherish friendships and will still go out of their way to bring joy to others. I am beyond blessed to have you all in my life. Thank you. The word doesn’t seem enough, but from the bottom of my hear, thank you. Yesterday I wanted to do some easy sewing; something quick and simple but something that would also be useful. With braxton hicks and baby kicks taking up pretty much every waking moment (and waking me up!) it was always going to be baby related. 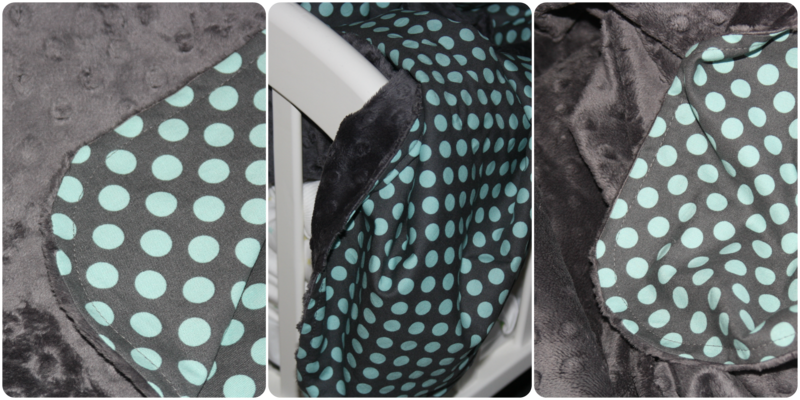 I’d always planned on making a blanket for the baby as they’re one of those things you can never have too many of. We have them strewn around the house and in the car when Boy was small and I doubt this time around it’ll be any different. In fact I ordered the fabric from Plush Addict months ago, pre-washed it and then… Nothing. I guess I got this weird idea into my head about tempting fate and all that, so it just sat there. Until yesterday, when I used Jane’s tutorial for making a very simple baby blanket. The only things I did differently were to round the corners (using a saucer to get the round) and slip stitching the gap closed, because I’m obsessive like that! 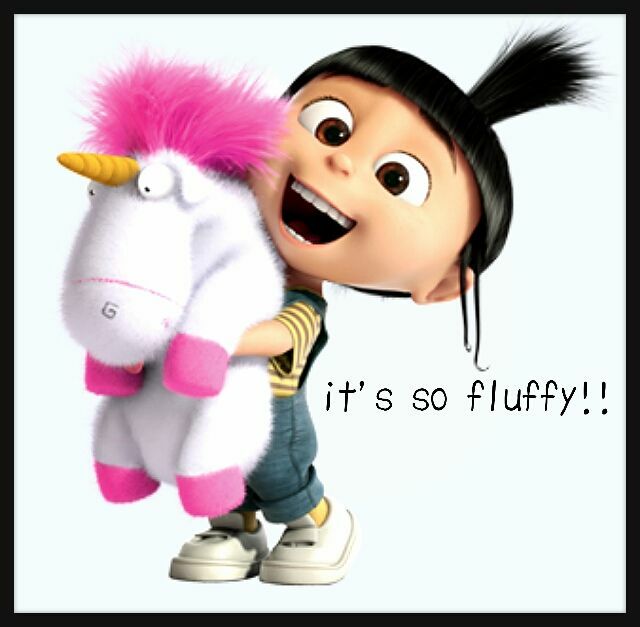 Oh, and use dimple minky because IT’S SO FLUFFY!! We don’t know whether we’re having a boy or a girl and to my mind, pewter grey and aqua would work well for both. I like them too so that’s what I used!! I was careful pinning this together because Minky is a knit and the polkadot is a woven so there was the potential for it all to shift around a fair bit. The only other thing I did was to sew with the cotton uppermost. There really isn’t a whole lot to say about it – but it was nice to spend a bit of time with the sewing machine, doing something quick and easy that I know will get used! Wow. 2014 has been one heck of a year and I know I disappeared for a lot of it. Growing a small person takes up a lot of energy – physical and mental. Today though marks the beginning of the countdown to meeting them for me though. I finished work today and have a couple of weeks annual leave before my maternity leave begins. It’s a relief as I was having re-occuring nightmares about my waters breaking in the office!! As my pregnancy with Boy was so short (our first scan dated him at 32 weeks), I always said I’d like to have one pregnancy where I do things properly. The last nine months have felt like the longest period of time whilst also disappearing so fast! Certainly the last couple of months have proven to be interesting and challenging all at once thanks to gestational diabetes. I’ve spent more time up at the hospital than I ever have in my life, but I also know that the amazing staff there are doing everything they can to look after me and our baby. I’m amazed by what they do and what they continue to do. The NHS is an amazing thing. I’m reconciling myself to the possibility of being admitted next week if our smallest person is still transverse (whilst they’re not measuring big, there is a LOT of fluid in my rather epic bump so they’re still summersaulting) and also induction at 38 weeks is pretty much guaranteed if they’re head down. Whilst it’s nice to work to a time frame, there’s a certain amount of stress that goes with it as they are being generated by medical risks. Plus, the thought of being on a ward for two weeks fills me with dread; I’m worried about Boy and Husband (who started a new job on Tuesday) and also being bored out of my tiny mind. But the most important thing is that our baby and I come out the other side happy and healthy. I trust my consultants and will do what they recommend! I don’t have a ton of sewn items to show you, although I have sewn two things that get worn a LOT. The first being So Zo’s maternified Dolore’s top. As my maternity wardrobe is basically shades of blue and black, the fact that this top has purple and orange in it and is made from Liberty jersey, means it just makes me happy every time I wear it. Which is as often as possible!! As it’s also two big panels of fabric it will see new life as a new top at some point in the future – something I think Zoe would approve of. The other is my Papercut Patterns Milano cape. I love the fact that so many from the sewing community helped me out when making it (Karen’s Bound Buttonhole e-Book, Madalynne‘s advice on redrafting the collar so it wasn’t flat, Emmie providing the horsehair canvas for said collar) and that it is so warm and fits so easily. So one item that took less than a metre of fabric and an afternoon to make, another that took miles of fabric and a significant investment in time. Both have filled solid gaps in my wardrobe and will continue to do so. What this period of time, that has at once been so slow in passing but also going by in a heart beat, has taught me is that I expect ridiculous amounts from myself. And of others. I have high standards and I don’t intend to let these slide, however I do want to be less rigid. I want to develop a little more fluidity into my life, grant myself and others some grace. 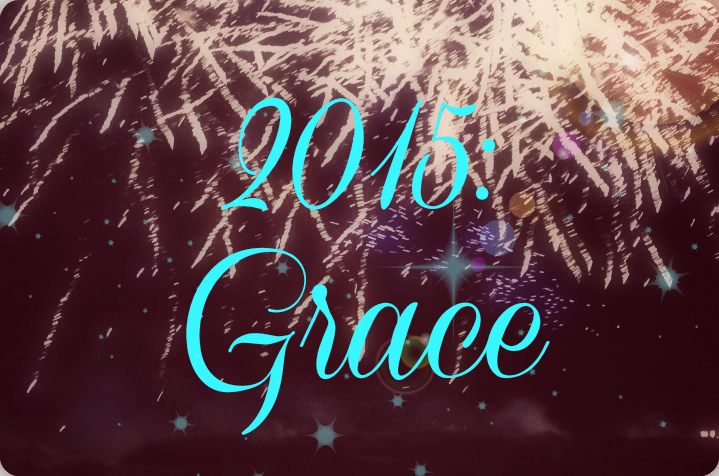 So I’ve chosen Grace as my word to focus on throughout 2015. I like the many definitions of the word; from the balletic elegance of a dancer, a type of poise and presentation as well as the elements of mercy, patience and goodwill. These are all elements I want to bring into my life over the next year and demonstrate to others. Of course, I still have plans but I’m not going to be so rigid in their application. If a planned make comes together or not I will not berate myself about it. I’m not going to hold myself to arbitrary timelines or schedules. The imminent life changes are going to make sewing and blogging time scarce and whilst there are things I would like to achieve this year on both these fronts I’m not going to hold myself to them mercilessly. My main focus will be my family (which is where it should be), closely followed by my health and well being (some of which is vanity driven regarding my personal aesthetics) and after that will come my wardrobe. There are a few things I want to try this year, and elements of my wardrobe I want to develop but most of these focus on returning to work. Spending six months or so in a limited (three dresses, one skirt, one pair of jeans and a few tops) wardrobe have made me focus on exactly how I want to present myself to the world. My beloved fit and flare dresses in prints are here to stay – I adore them and the fabrics they show case. What I want to develop is my work wardrobe. I also really really want a shirt dress just like Annabelle’s and have bought the pattern – it’s the tabs to hold the sleeves up (a detail I just love!) as well as my beloved fit and flare silhouette. I do have some pre-work sewing loosely planned. The above shirt dress that depending on fabric could work in both home and professional settings as well as Tilly’s Miette wrap skirt that will be able to cope with my body fluctuating for a while after birth. Beyond that, we’ll see how the mood takes me. I hope you all have enjoyed your Christmas and New Year celebrations and whilst I know I have been rubbish at commenting on blogs recently, please know that I enjoy reading what you’re up to and living vicariously through you all! Wishing you all a happy and healthy 2015 and I’ll catch up again with you all at some point! !